Click here to watch an interview with Gordon Korman about his book The 39 Clues: One False Note . Click here to watch a video booktalk about The 39 Clues: The Maze of Bones by Rick Riordan, author of Lightning Thief , book 1 in the Percy Jackson & the Olympians series. 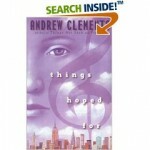 Click here to watch a video book trailer for Things Hoped For by Andrew Clements. Click here to watch a video booktalk about Chasing Vermeer by Blue Balliet. Those who know me well know that I cringe whenever someone uses the nouns “boy” and “girl” as adjectives, whether it’s to describe a color (Since when did rays of reflected light belong to a particular gender? ), a book, or anything else. That being said, some authors tend to write for and/or attract a narrow audience. Norma Fox Mazer is one such author. 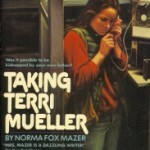 Now, I must confess that when I picked up Norma Fox Mazer’s Taking Terri Mueller , I had convinced myself that I was going to “take one for the team” (The “team,” of course, is a legion of former and future students.) and read a “girl book.” Having finished the book, I no longer have visions of martyrdom. Gwen’s grandfather has disappeared from their home in New York City, but he’s left her a phone message telling her not to worry–and to let no one know he’s gone. The timing couldn’t be worse. Gwen has violin auditions soon at Manhattan’s top music schools. More stress is not what she needs. The she meets Robert, also in town for auditions, and her new freedom actually seems to have some benefits. After all, she’s seventeen, suddenly on her own, and there’s no place on earth quite like New York. But below the surface, other forces are in motion. There’s the great-uncle who keeps coming to the house, insisting he has to talk with her grandfather. There’s the strange man Gwen sees one day when shopping, and then there’s the discovery, right in her own home, that brings the NYPD crashing onto the scene, uniting Gwen and Robert in ways neither of them could have foretold. In this remarkable follow-up to the wildly popular Things Not Seen, award-winning author Andrew Clements brings readers a multi-layered story about art and identity, about friendship and family, and ultimately, about life and love. Unbeknownst to me, Things Hoped For is actually the second book in what will soon become a trilogy: Things That Are is scheduled to be released on September 18, 2008. It’s not necessary to have read Things Not Seen to appreciate Things Hoped For. But you can bet Things Not Seen will be next on my reading list, followed by Things That Are as soon as it’s released.